As you may well be aware, we have a great series of stamps from Elena Guzinska, aka Zinski Art. 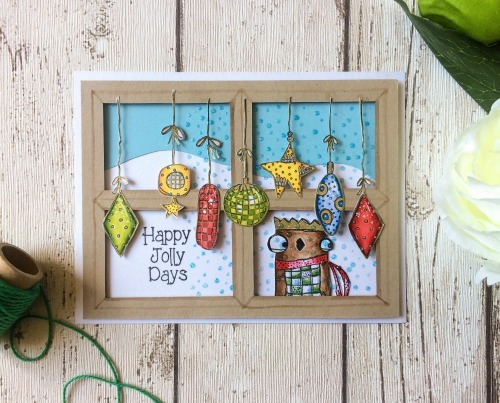 In this post, Keren Baker will be sharing her ideas with 2 of the Christmas sets, here is a reminder of all four, Keren will be working with sets 18 and 19. All these new products are available from your PaperArtsy stockists now. See details in the list at the foot of this post. Hi everyone, Keren Baker here. Christmas is always a busy period in our house so it's good to inject a little fun into all the preparations. These sets by Zinski Art had me smiling whilst I was creating them! 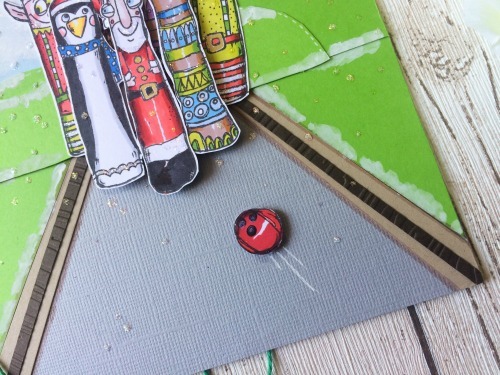 Tonight I wanted to share a few possibilities with these stamps, and show you that by taking elements of each and transforming parts of them, you can come up with some really unusual ideas! 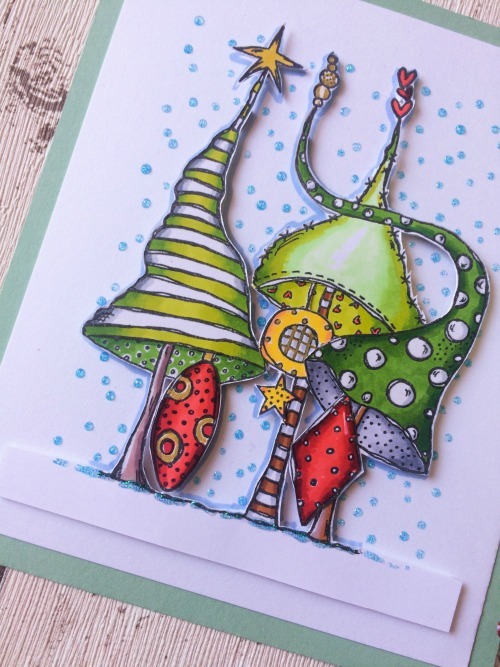 Absolutely loved the images- the quirky trees looked like they wanted embellishing so I just slotted a few extra baubles to add the 'over-the-top Christmas decorated' vibe! So much depth to the illustrations that makes it super easy to colour. If you love colouring, you'll adore these images. These are perfect images for way beyond Christmas too. Think of beautiful greens with doodled flowers or fruit on! 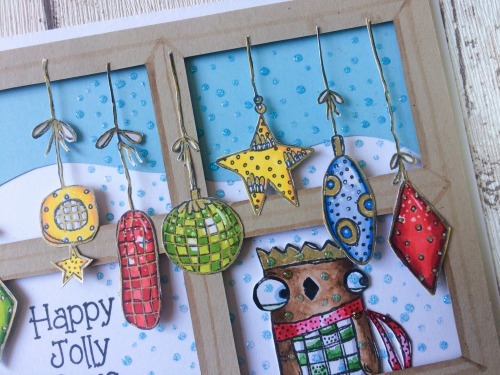 The row of baubles reminded me of a window decoration and the little owl guy looked chilly so I imagined a wintery day with the warmth of the decorated living room and the little fella looking in longingly! I did feel a little sorry for him, so I intend on creating another scene with a roaring fire, the baubles hanging off it and the altogether warmer critter with the ends of his scarf snipped off and warming his feathers by the roaring fire! These guys are so full of character. 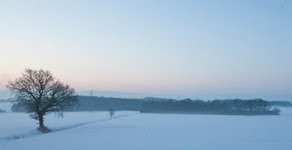 Their shape reminded me of ten pin bowling (ok, there aren't quite 10 of them, but go with me!). I used the eye of the face on this set to create the bowling ball. Outside bowling on a snowy day!! These characters can be painted and coloured and put into all sorts of scenes. They're guaranteed to make anyone smile!! You can make them look more friendly by adding a coloured pupil. Purple pupils anyone?!! When I was deciding what to create for the set, the large nose on the face looked so much like an 'o' and the characters were straight enough to make into alphabet letters. Adding to the fun is the fact they look like they are carrying the middle guys! I was going to add colour to each image but felt it would detract from the concept of the letter. Once you open up your imagination, this set is going to give you a ton of possibilites!! 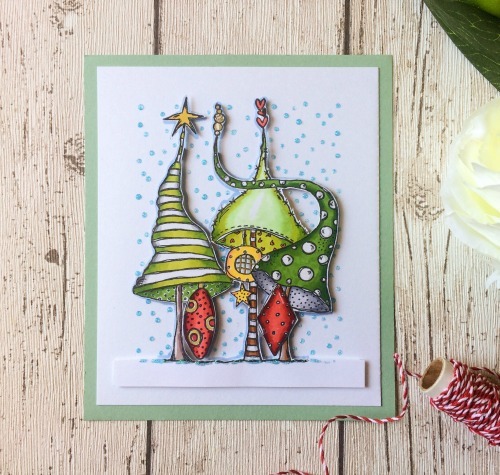 If you want some lighthearted quirky/whimsy injected into your Christmas makes and cards, this set is PERFECT! I haven't even used all the images, and the beauty of the baubles for instance, is that by adding length to the strings, you can create even more flexibility. They've been cleverly designed so that you can do a basic stamping and you have a full image with little extra needed or snip them apart (like in the trees or the straightened characters) and you have individual images to get really creative with. Do add this collection to your seasonal stash; fun will ensue!! 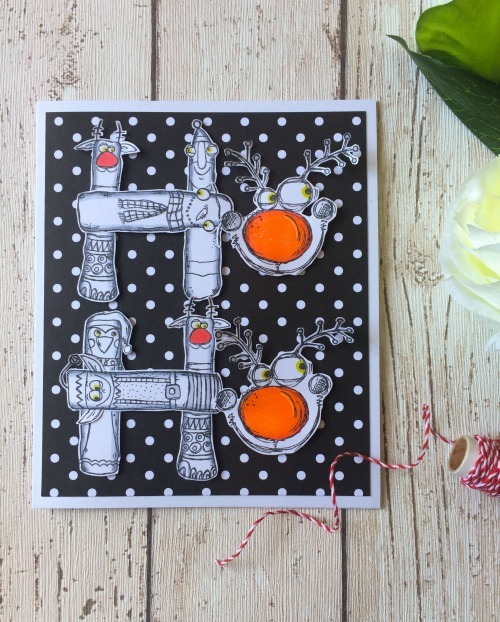 Wow, love your makes Keren, these stamps will lead to all sorts of fab,quirky projects. Love your ideas! 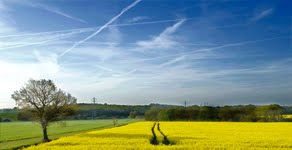 From plenty of colors to almost black & white, amazing palettes! Love how you mixed the different stamps. oh, Keren, I LOVE your samples and your off the wall thinking! the ten pin bowling card is just extraordinary! 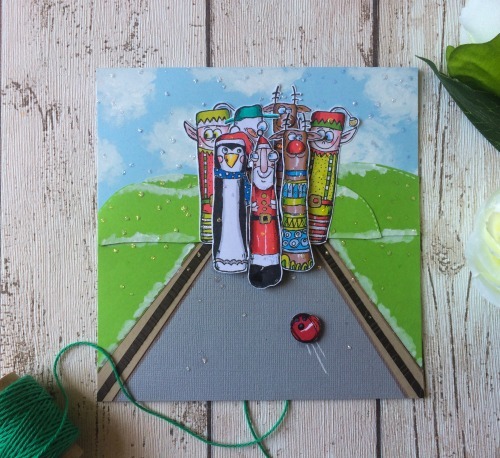 Oh my goodness Keren, so many stunningly beautiful and creative, ingenious cards!! Wow these are gorgeous, you are so very clever, love them. Help!! I really love them !! I really want them!! I really need them!!! WOW! These are so incredibly detailed and perfectly colored! Amazing inspiration with these fab new designs. Superb work with the new Zinskis, Keren - I especially love those hatty trees at the very top, and your skittles are such fun! Fab baubles dangling in the window too. Such great ideas, Keren, your samples are fantastic. 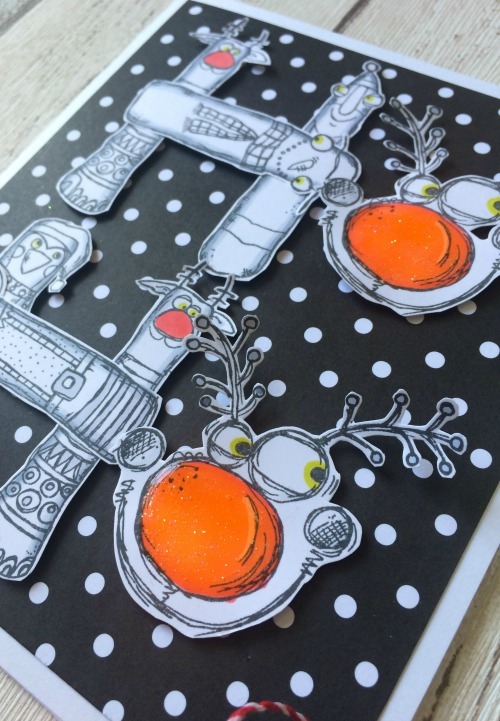 Fab stamps, great samples !